If we go back and consider the actual substance of "Climategate," we see that it was only some minor FOIA transgressions and a few arguably embarrassing comments made in what had been thought to be private. It only got traction because 1) Phil Jones, presumably on the advice of some idiot in the UEA press office, completely clammed up rather than provide the press with the perfectly reasonable explanations available to him, and 2) the Guardian, fresh off its success in exposing the phone hacking scandal (a large and real one), detected in Phil's silence a potential cover-up and pulled out all the stops in order to flush out the truth. (Plus we should not discount the prurience value of hacked emails, as we saw again last year.) Then, because it was the climate science-friendly "left" Guardian pushing it, the scandal acquired enough seeming credibility to get the various inquiries launched. British tabloids in general dream of this sort of thing, thus Rose's ridiculous attempt to launch "Climategate 2." Erratum: You want "transgressions" rather than "digressions." The difference is almost entirely due to the different anomaly bases (HADCRUT 1961-90 vs NOAA 1901-2000). John bates has a comprehensive article up over at Judith. Note, the Mail is not a Murdoch paper as stated. Climategate may have been the Russian petrostate's first successful use of hacking to influence world politics. Tony, I would rather no comment on people, so I will not publish your second comment. If only because that would be quoted elsewhere to pretend I only attacked the person. I never expected the headlines in the Daily Mail song to be real; it is a song. If the Daily Mail becomes an official satire magazine, I will not complain anymore about the content being wrong. Yes, der Spiegel is a decent journal in Germany. I hope you are willing to put yourself in the position of Germany, who already had a similar problem, which devastated the country and much of Europe and the world. To prevent this from happening again, Germans are well educated to recognize the start of fascism. It is thus logical that the immune system of Germans for this kind of problems responds faster, especially faster than that of fearful people who do not mind a bit of authoritarian leadership that much and somehow do not fear how it ends. I don't know if you're aware of the history of the Mail. If not, this may help. Note that the Mail is still owned by the Rothermere family today. Just listened to the Daily Mail song again. Hard do believe that people really believed that "I am not racist, but" is a real DM front page. More, also satirical, context on The Daily Mail provides the video: Charlie Brooker's Daily Mail Island. I guess Daily Mail readers will not like it. tonyb: reading Karl et al would have answered Bates' own question about using 90% confidence intervals, rather than 95%. Hint: comparison with IPCC report, which happens to use 90% CI (as noted in Karl et al). I am also rather surprised Karl is accused by Bates of having pushed his co-authors to make decisions that would increase warming, since Karl was not directly involved in the underlying datasets, ERSST.v4 and the ISTI database. There are no specific decisions in Karl et al that change anything about these two datasets and thus the observed warming. Lars Karlsson, I would prefer not to publish your link to the blog of Curry. I am sure people interested in misinformation will be able to find it and prefer not to send people to deceptive information. She also explicitly refuses to engage with my arguments. Huh, according to https://arstechnica.com/science/2017/02/article-names-whistleblower-who-told-congress-that-noaa-manipulated-data/ Bates was demoted by Karl in 2012. So we're in familiar "disgruntled former employee" territory. It seems that testing the pairwise homogenization method used by GHCN should be possible: just (!) set up a data set simulating the real data with random variation, occasional biases (site changes, TOBS changes etc) plus a known trend and see how well the method does at removing the known biases. Has this been done? Exactly, that is very easy. NOAA naturally did so. There was also large study with many participants including NOAA's pairwise method doing exactly that, I was the first author of that study. That was how I started working on this topic. There is a new similar study coming up in the International Surface Temperature Initiative. A detailed refutation of Bates's claims about the process, by an indepedent scientist who worked with NOAA and co-authored all the relevant papers underlying Karl et al 2015. But Victor, Judy points out that you are unprofessionally smearing The Daily Mail. That is truly unheard of. Are you not ashamed of attacking such a reputable and esteemed newspaper? I thought I was quite friendly by not linking to the Wikipedia page of the Daily Mail. 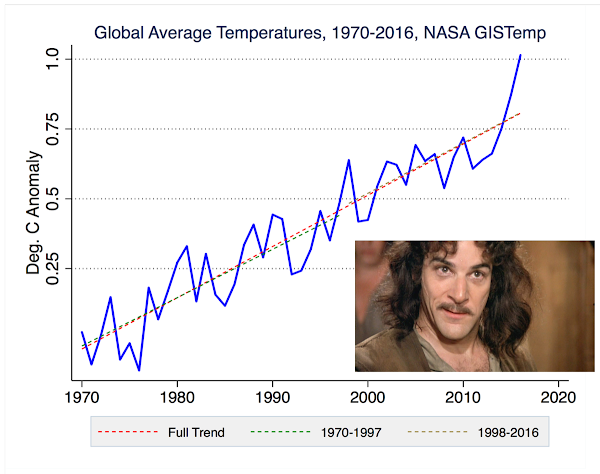 Victor, as everyone knows, sometime around 2013 there started to be this meme of a hiatus in global warming, because the temperature record for several years was tracking below the aggregate model projections. It became noticeable enough that climate researchers started to explain it. This article by Carl Mears is one example. http://www.remss.com/blog/recent-slowing-rise-global-temperatures. Mann and Steinman published on natural cooling in the Pacific as an explanation for the discrepancy. You know all of this, of course. 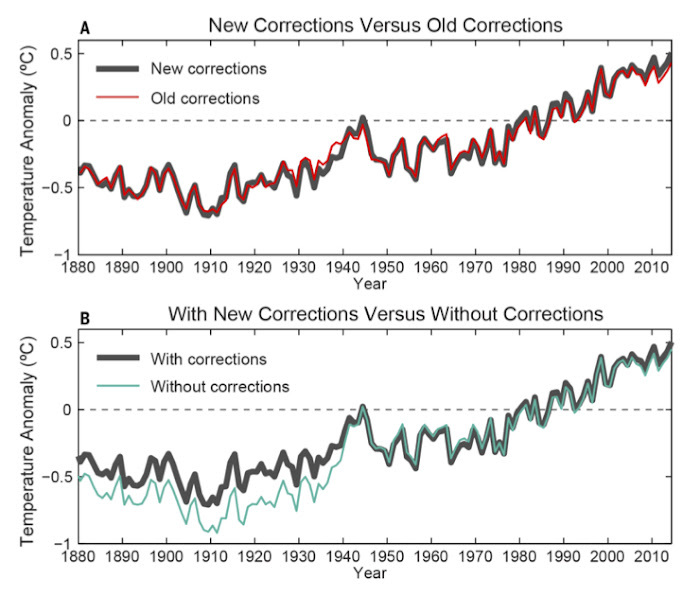 I bring this up as the background to this question: If the prospective temperature record had instead been tracking the models fairly closely, would Tom Karl have gone through the same process of retrospectively discovering and correcting “artifacts of data biases” in the NOAA temperature record? Is there a risk here of post hoc data adjustments that are biased in one direction? Is this a valid question? This is probably not a good example because the difference between buoys and ships was known already in 2008 (likely earlier I was not in the field then and am not an expert on SST). Because of the fast shift from ships to buoys it became more urgent. 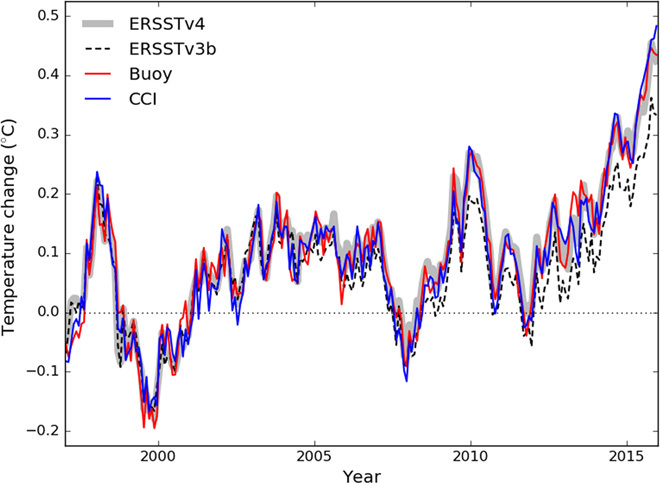 This update of ERSSTv4 was published in 2013 and the work started earlier; probably immediately after ERSSTv3b. That being said, such risks naturally exists. WWII sticks out like a sore thumb. If it had been a cold period for natural reasons and the warm bias of the measurements in that time would have masked that and made the graph nice and smooth, this problem likely would have gotten less attention than now where it is a peak in the raw data at an historical time. Scientists should always be aware of possible biases and fight them. The ones who do that the best are most successful. I would almost wish my colleagues had large biases, that would make it easier for me to write big publications. But they are pretty good and smart. Thanks for the detailed comment. Please delete the reference to the Mail as a Murdoch paper (I know it's crossed out but 'merchants of doubt' like Rose would seize on that, ignoring the detailed scientific evidence, and use it against you). The term 'merchants of doubt' was coined by Naomi Oreskes in her excellent book of the same name, also made into a film (available on youtube) which I recommend to provide some historic context to this debate. re: your twitter vote on whether Rose's article is more deceptive than Kelly's, I'd opt for Rose on the basis that Kelly's organ has not yet been banned by wiki.